PDR: Simply the most economical, fast, eco-friendly system for dent removal. Dent Devils save you time, money and improve the value of your vehicles! "Dent Devils have given us results that have amazed us not to mention our customers, reflecting in cost saving versus the option of repairing, also this keeps the vehicle original. Shane has clever skills that we rate second to none." Shane Griffin, the director of Dent Devils Ltd, has been in the car industry for over 25 years both in NZ and London, UK. With a desire to expand his knowledge and experience in the car industry he trained and worked alongside some of the best Paintless Dent Removal technicians in the USA. On returning to NZ in 2000 Shane set up his own dent removal company. Shane and his team operate a mobile service Auckland wide. Dent Devils are a telephone call away for all your PDR work. We believe our edge over other PDR companies is our ability to remove more complex dents. Often difficult to reach or time consuming, customers are lead to believe there is no other option but a costly traditional panel repair. Dent Devils push the boundaries of PDR and see such dents as a challenge and the opportunity to demonstrate our PDR capabilities. After our initial inspection of vehicles, and in the instance that the work falls outside the capabilities of PDR, Dent Devils work in conjunction with reputable companies that specialise in the automotive refurbishment and remarketing industry. 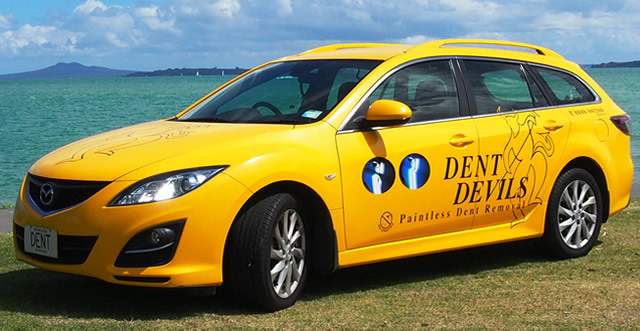 Dent Devils - Guarantee to provide a premium service at cost effective rates. Contact Us - to discuss your vehicle requirements.